Bake both cakes in 9x13 pans according to package instructions. Cool cakes, then freeze for two hours. Cut a slug shape out of a piece of coated cardboard. Use slug shape as a template. Cut out a slug shape from each cake, cutting the end of the tail out of a scrap piece of cake. Set one slug-shaped cake on the cardboard template. Stack the second slug-shaped cake on top, with a layer of frosting in between. Carve cake into a slug shape. Add two more large pieces of cake, using frosting in between the layers, to create Jabba's upper body. Carve it into the correct shape. Color and roll out fondant into a 24x18-inch rectangle. Drape fondant over cake, smooth and remove excess. Set cake on a serving platter. Sculpt arms out of fondant and attach using a small amount of Betty Crocker™ Cookie Icing. Sculpt Jabba's head out of fondant and attach to cake using two dowels. Insert 2 round orange candies for the eyes and add facial features like a chin, nostrils, and mouth. Roll remaining fondant out then drape over the head, allowing the fondant to fold into wrinkles around the head and arms. Cut out eye slits, revealing the orange candies. Add pupils to eyes using a black food coloring marker. Add wrinkles and scratch marks all over body. Paint with some green and brown food coloring to add dimension to skin. Surprise your Star Wars fan with a cake featuring the ultimate galactic gangster! I'll never forget the hype around the first Star Wars movie. I was twelve and my friends couldn't stop talking about it! The entire audience was mesmerized by the thrilling plot, groundbreaking special effects, and constant action. I liked all of that too, but what I found most appealing was the young Luke Skywalker, who I thought was dreamy, and the even more adorable R2-D2. And of course, I cheered along with the entire audience when Luke blasted the Death Star! The buzz about the movie continued for weeks and many of my classmates saw it dozens of times. Having lived through the entire era of Star Wars, I’ve enjoyed watching the evolution of the characters and special effects. One of the most amazing aspects of the Star Wars saga has been the alien creatures – particularly Jabba the Hutt, a crime boss with a bounty on Han Solo's head. I vividly remember seeing him for the first time; I was personally totally grossed out by his slug-like appearance, but many of my friends (mostly high school age guys) thought he was really cool. So when I was asked to create this cake, my husband, who was one of those guys, was really excited. He even helped to make sure I got this one just right! To get started, mix up two Betty Crocker cake mixes and bake them in 9x13-inch pans. After they cool, pop them in the freezer for about two hours. This will make the cakes easier to carve. Cut a slug shape out of a piece of coated cardboard. Set the cardboard over the cake and cut out around it. You wont be able to cut the entire tail out of the first piece of cake, just cut what will fit. Then cut out the rest of the tail and remove all the excess cake. Do the same for the second cake, reserving two large pieces of cake for Jabba's upper body. Clean off the cardboard template and set one of the slug-shaped cakes (including the tailpiece) on the board. Stack the two slug-shaped pieces of cake, using frosting in between. 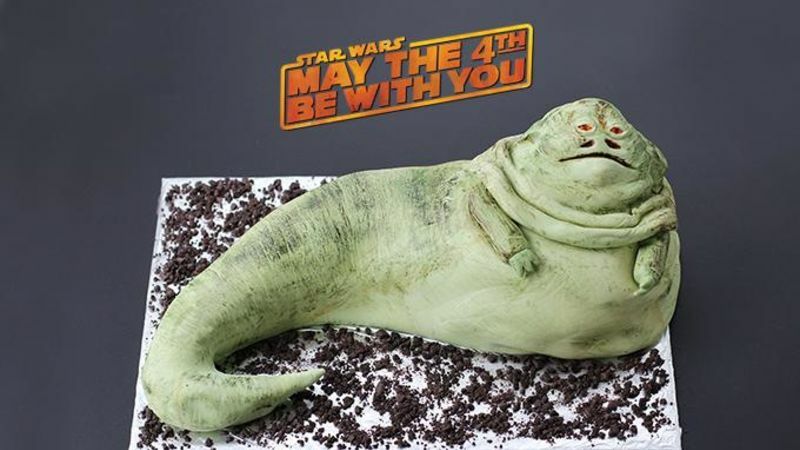 Carve the cake to look like Jabba's body. Stack two more pieces of cake, putting frosting in between the layers, over the larger part of the slug shaped cakes. Carve them to look like Jabba's upper body. Pop the cake back in the freezer for about 30 minutes to make frosting easier. Frost the entire cake using Betty Crocker Hershey's Cookies 'n Cream Frosting, reserving the crumbs to decorate around the finished cake. Color fondant to look like Jabba's skin using a combination of brown, yellow and green icing colors. I think my fondant is a bit too green, but the end result looks pretty good. Roll the fondant out to about 24x18-inches. Then roll it up on your rolling pin to make it easier to lift. Smooth the fondant over the cake and cut off the excess, rolling the edges under the cake. Set cake on a serving platter, cake board, or cardboard covered in tin foil. Sculpt some arms out of the fondant and add wrinkles. Attach them to the cake using Betty Crocker Cookie Icing. To keep one of the arms in place, I propped it up until it dried. Stick two dowels down into middle of the tallest part of the cake, cut so that about an inch and a half sticks up out of the cake. Shape Jabba's head out of fondant and press down onto the cake over the dowels. Add Jabba's facial features, like the nostrils, mouth, chin, and orange candy eyes. Roll out the remaining fondant and drape it over Jabba's head, leaving wrinkles. Cut eye slits and add wrinkles and details to Jabba's head. Use a black food coloring marker to make the pupils in Jabba's eyes. Gently carve wrinkles and scratches all over Jabba's body and tail. Put a dab of green icing coloring on a plate then a dab of brown icing coloring on the same plate. Use a brush to pick up some of each color, and then lightly brush the color to accent Jabba's skin. The cake will be best served within a day of being made. Cover and store at room temperature. And remember ... May the 4th be with you! TM & ©2014 Lucasfilm Ltd. All Rights Reserved. Used Under Authorization.